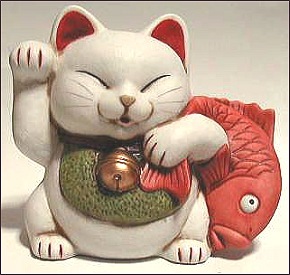 Maneki Neko and Daruma are often found together. Daruma may be used to make wishes come true. He's purchased with two blank eyes -- When the wisher makes his wish, he can fill one eye. When the wish is granted, the wisher thanks Daruma by filling in his other eye. Unfortunately this has become politically incorrect, so now many Daruma figures have their eyes already painted in. 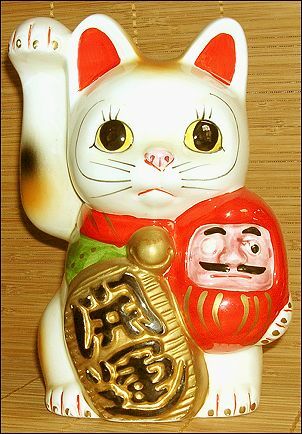 This little Tokoname-style Lucky Cat is holding his friend Daruma. Note that one of Daruma's eyes has been colored in! Height 7.5" (18cm), material ceramic, slotted & stoppered for a piggy-bank. Lots of ID for a change! A red & white "KATO KOGEI" sticker on the back; a blue & white "Hand Painted KATO KOGEI JAPAN" sticker on the bottom; a Kato Kogei logo impressed into the bottom. This beckoning boy seems to be equal parts Maneki Neko, Daruma, & the kid from WHERE THE WILD THINGS ARE. A very attractive bright red ceramic bank with gold decoration, he stands about 5" (12.5cm) tall, came new, a birthday present for me (2008). No id-marks. The fan (obi) & a bottomless sack of riches: Associated with the the deity "Hotei" - bringer of happiness. A dignified tricolor fellow carrying a sack of goodies & beckoning with an "ogi" - a folding fan. Height 3 1/4" (8 cm), ceramic, with a real metal bell. This is Hotei, of the Shichifukujin (7 Deities), the god of happiness & contentment. He is the only true Japanese member & also the only human one. He's very popular in Japan. The Japanese "biwa" mandolin: Associated with the the Shichifukujin deity "Bensaiten" - goddess of the arts. A small, painted-plastic Lucky Kitty charm purchased new. 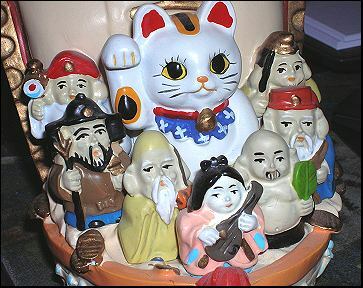 Bensaiten is the only female member of the Seven Deities of Good Fortune. Height is approx 3/4" (2cm); made in China. No ID. The magic hammer: Associated with the the Shichifukujin deity "Daikokuten" - bringer of wealth & prosperity. 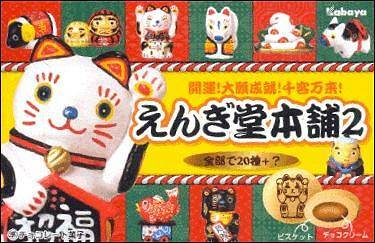 Maneki Daikokuten! One of the "Seven Deities of Good Fortune". Unglazed, but nicely painted with good-luck stickers and a real metal bell & fancy string. Also included is a fabric pillow which is black with off-white cherry blossoms. 4" tall, Japanese ceramic, & no ID. 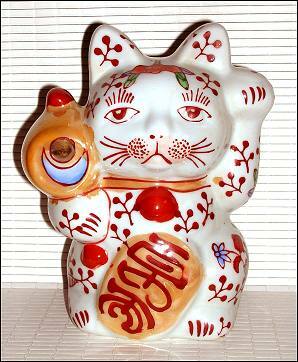 I purchased this unusual Maneki from my friend Roz in England. I know this looks like a police lineup photo, but he's really quite pretty with his autumn colors & his lusterware glazing. He carries a magic hammer in imitation of Daikokuten, the god of wealth & prosperity. Height 5" (14cm); made of gray porcelain; a bank. 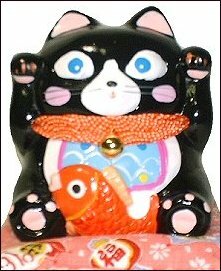 The "Lucky Tai Fish" (sea brim) is Maneki Neko's favorite companion. Associated with the Shichifukujin deity "Ebisu the Fisherman" - bringer of abundance and representative for the working man. 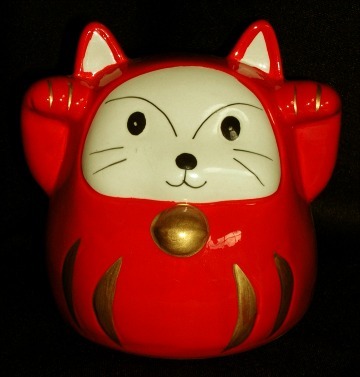 An early eBay purchase, this Maneki Neko has a BIG red Lucky "Tai" fish slung over his shoulders. 3" (7.5 cm), ceramic, with ID: 2 characters in a circle beside the tail. From an Hawaiian seller, 1999. An unusual Happy Cat w/ a flat-top haircut. 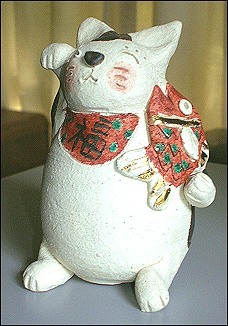 I bought this kitty at the Japanese Tea Garden during my trip to San Francisco, 2004. 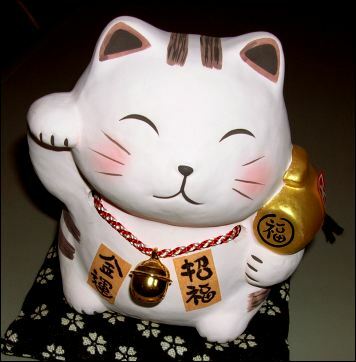 He's made of painted ivory-colored plastic, stands 2" (5 cm) tall, & has a rectangular "TAI" logo stamped on his back. A plump black Neko with a fancy cloth collar & a metal bell. He came with a beautifully patterned cloth pillow for his dark side, which bears a large circular gold-&-black sticker with Japanese chars. 4" (10 cm) tall. Purchased new from a Japanese seller's website. A ceramic bank brought new from Japan. 5" (13 cm) tall. With a round white sticker underneath bearing an orange-red chop mark & also, embossed into the lower back, a large capital "M" with a smaller capital "R" inside it. 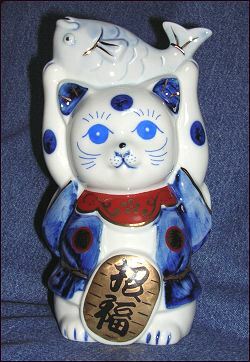 A pretty blue & white ceramic Lucky Kitty & his prize. (Representing "Ebisu" the fisherman.) Decorated in black, gold, & rust red. A 2006 birthday present from Roz, who bought him from a Canadian merchant. He's 6.75" (17 cm) tall. A handmade ceramic neko from Roz, who took a Japan cruise in May of 2005. (Lucky Roz!) 4" (10 cm) tall; mostly painted, unglazed ceramic with small spots of green glaze & gold. No ID markings onboard; but he arrived with a matching brownish-red cloth pillow & a brochure from the artist, Kajitani Yoshika, http://www.eonet.ne.jp/~kajitani/. 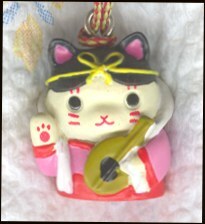 I found this pretty Lucky Cat charm in a box of Maneki Neko cookies. He's painted plastic, 1.25" (3 cm) tall, & comes with a string & bell (& also some very tasty cookies with chocolate filling & an MN image on the outside of each one). No ID, except on the packaging, which I can't read. From Japan. A happy cat with a cloth pillow, fish, & tall banner. The large black characters on the banner declare that he will keep your family/household safe & away from harm. The smaller, red ones say "happiness" & "good fortune from now on". From Japan. 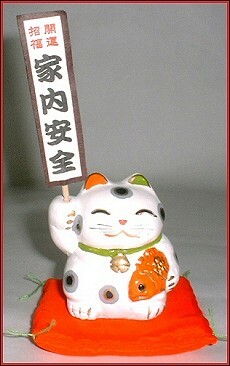 The cat is 2.8" (7 cm) tall; painted ceramic, w/ wood & paper for his banner. Bishamonten - god of protection & religious zeal, carries a pagoda of treasures. Ebisu - god of success in all honest labor, carries a lucky "Tai" fish, bringing special luck to fishermen. Daikokuten - god of wealth & prosperity, carries a magic mallet. Jurojin - god of longevity. Bensaiten - goddess of music, arts, beauty, & fertility, carries a Japanese "biwa" mandolin. Fukurokuju - god of wisdom. Hotei - Japanese & the most popular of the 7 - god of contentment & happiness. 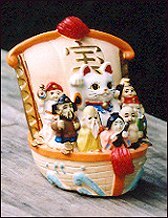 A New Year Arrival Boat carries Maneki Neko & the Shichifukujin, along with many lucky symbols. A ceramic bank, 4.5" (11.5 cm), ID: a white paper "CHOU IMPORTS" price sticker & a "Made In China" sticker. Purchased new from Chou's, Memphis.